Foam cookie on wire frame has elastic shoulder straps, soft-sculpted "chocolate chips"
Quick, whenever you think of two things that go perfectly together, what's the first pair that pops into your mind? It's harder than you thought, isn't it? 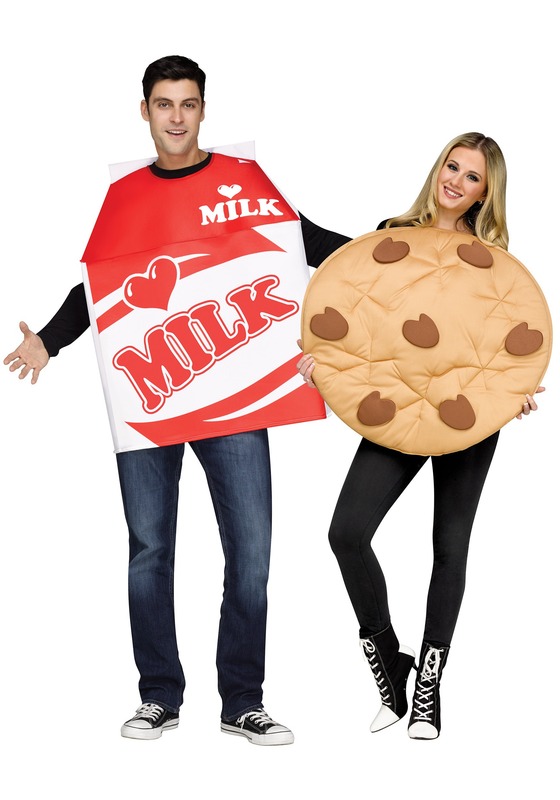 (especially now that we've put you on the spot) While you're pondering, we'll just come out and say that the awesome combo of you and your sweetie wearing this adorable Cookies and Milk Costume is hard to beat! Okay, thought of any other good ones yet? Chocolate and peanut butter is a classic pairing, for sure, along with movies and popcorn, and hamburgers and fries. And believe it or not, there are even some combos that don't involve food! Is anything better than a hot summer day and a swimming pool, or skydiving and basketball? What, they don't have that where you live? Maybe that was just a dream we had. You must have had milk and cookies before, though, so you know how perfect they go together. (and if you actually haven't, then drop everything and go fix that immediately) One bite of your favorite warm, freshly baked cookie-of-choice and you'll already be convinced, but then you wash it down with some ice cold milk, and... actually we just got really hungry. What were we talking about, again? Oh yeah, cookies and milk costumes! The coolest part about these foam and polyester pullover costumes is that not only do they make the two of you look like a winning combo, they are also two costumes in one. Since you already have both of your costumes picked out, think of all the time you'll save, which you can then spend deciding who gets to be the milk and who gets to be the cookie!